Sure you can just ride your local loop over and over again. And you can just keep visiting the same old trail centres week in week out. And you’ll have lots of fun doing so. Any mountain biking is ace. But discovering new places to ride is one of the best things about mountain biking. Nothing beats ripping around a brand new (to you) trail and subsequently adding it to your knowledge base of cool places to ride. In the old days all you had was word of mouth from your mates and the occasional route published in magazines. Nowadays we have a lot of technology on hand to help us find new trails. The holy trinity of trail-finding tech is: GPS, online mapping and satellite imagery. There are free-to-use websites that display proper Ordnance Survey mapping – we like Streetmap. Have a browse of an area you’re interested in and note any interesting looking bridleways or byways. Maybe you’ve seen some intriguing looking trails out of the car/train window during your commute? Maybe you’ve seen something on YouTube? Maybe you’ve seen some segments on Strava that have caught your eye? Strava’s “Segment Search” is a great thing for finding trails. It’s even worth looking at mapping of your local area as there will be things you’ve never spotted. If you just want to see what bridleways there are in an area (without any other mapping info cluttering things up) then bridlewaymap.com is a brilliant site. There’s also Strava’s Global Heatmap thingy which shows you where all Strava users have been most. It doesn’t link/mirror up to any OS mapping or spit out any .gpx stuff but it’s still a great starting point for seeing where all the Strava-using locals are riding. The aim here is to find the bridleways/byways that you’ve spotted on the mapping and use satellite images to see what they actually look like on the ground. You’ll be surprised at the level of detail. If you can see something on the satellite pic, there will be a trail there. Conversely, if you can’t see a trail on satellite imagery then chances are there isn’t much of a trail there ie it’s a right of way that passes over featureless, usually slow-going ground such as bog or heather. Google Earth is an obvious choice but Bing Maps have some areas covered in better detail at the moment (just select ‘Aerial’ from the drop-down menu). 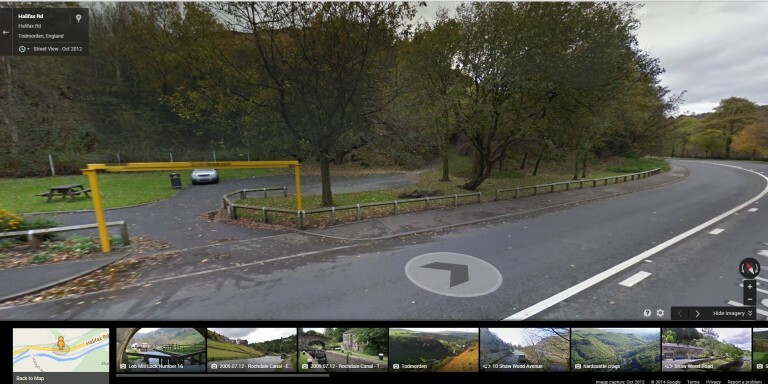 Google Streetview is an excellent tool for help identifying and locating the start (or end) of trails that are near roads. There are a few online route plotting websites out there but not many of them use proper Ordnance Survey (OS) mapping. It’s just easier and more accurate to use OS mapping. You can just about make do with other sorts of mapping but it requires a bit of guesswork when it comes to ‘drawing’ on your route on to the map on screen. The best site we’ve found is bikehike.co.uk. It’s a simple but ingenious site; one half of the screen is satellite imagery, the other half is OS mapping. Both halves are linked/mirrored together in sync so it’s easy to match the satellite pic to the mapping pic. Be warned, it has a daily limit of of OS mapping that it’s allowed to give out and sometimes it reaches this limit towards the end of busy days. It’s best to use bikehike earlier on in the day. From bikehike and other such sites it’s possible to save GPS files to your computer of routes that you have created. Save your file as a “.gpx” file for maximum compatibility with other devices. 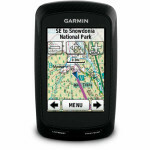 Get a GPS device and load up your ,gpx file into it. Go and ride your route. A Smartphone will do at a push but it can be tricky getting a .gpx file (or indeed any sort of file!) into a Smartphone. Emailing yourself the .gpx file and opening it in an app like GPX Viewer is an okay workaround but there’s no on-screen map to help with navigation. Other problems with Smartphones: battery life is poor, they aren’t waterproof, they often aren’t very accurate with GPS signal/location. If you really want to make life easier – and you want to be doing a significant amount of trail finding – then you really should consider getting a proper GPS device. They’re better and more affordable than ever. Read our blog Guide to GPS Computers for more help. GPS devices come with handlebar mounts so it’s always there in front of you (no stopping to claw a phone out of your pocket). The battery lasts for ages. They’re sealed against the weather. They’re extremely accurate with GPS signal. Most of them connect up to sites such as Strava after the ride is complete. Some of them can even talk with your Smartphone (via Bluetooth) so you can upload your ride info to the internet as you go (to Strava, Garmin Connect, Facebook and all that social jazz). Acquisition Time: the time it takes a GPS receiver to acquire satellite signals and determine your position. Waypoints: Check points on a route ie when you’re plotting a route on online mapping each click of the mouse is a waypoint. Route: A group of waypoints entered into the GPS receiver in the sequence you desire to navigate them. Track: Your current direction of travel relative to a ground position. GPX: GPS Exchange Format. A common GPS data format. The format is open to everyone and can be used without the need to pay license fees. GPX data (location, elevation, and time) can be used to interchange GPS data between devices and software packages or websites. Tagged beginner, bikehike, garmin, google earth, gps, how to, mtb, skill, strava, streetview, technique, trail finding. Bookmark the permalink. There is a too at http://rootsrocks.club/ that shows Strava heatmap and your Strava activity, you could figure out new trails and even edit your route.